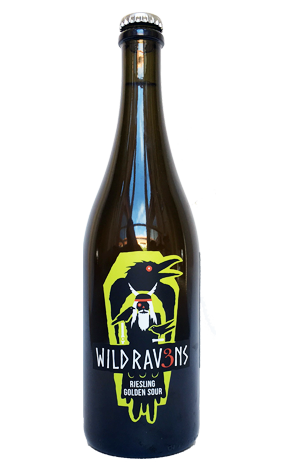 In the past couple of years, we've noted how 3 Ravens head brewer Brendan O'Sullivan has been steadily turning every bit of spare space and equipment into part of an ever-broadening exploration of wild, sour and mixed fermentation beers. On our most recent visit, to check out the first of the second run of beers under the Wild Ravens banner, it felt like things had moved a step further; while most breweries now make room for a lab, the Thornbury operation is beginning to feel more like a giant lab with a brewery tucked at one end. You'll find rows of barrels with all manner of liquids and combinations of yeasts and bacteria lining the walls (one is titled, simply: "ACID") plus various other containers big and small with cultures and trial batches bubbling away. One of the larger ones is actually a dedicated fruit tank, which is where part of the beer that is the first of four new Wild Ravens took shape. The brewery team travelled to Rochford Wines to collect whole bunch King Valley Riesling pomace (what's left after the winemakers have squeezed out most of the juice) and combined them with a golden sour brewed with rye and oats that had already been aged in oak. After a couple of weeks extracting as much from the grapes and skins as they could, the liquid was extracted, blended back with more of the base beer and put into bottles, where it continues to condition. Also in there is the house "yeast" (the speech marks indicating it's rather more than a simple yeast – it's now a combination of every commercially available "wild" yeast culture and bacteria they could get their hands on plus various other cultures from previous brews and beers from other breweries). The brewers expect it to continue to develop and become increasingly complex over time. For now, it's fruity, acidic and dry with some tannic qualities too and hints of the funkier elements of the various Brett strains and pediococcus bacteria apparent in the tail.